TIP began as Transport Pool with branches in the Netherlands and Canada. In 1968 US based Transport Pool opened its first international branch in the UK and a corporate office in Rotterdam, The Netherlands. That is when the concept of trailer rental pioneered. In 1971, a holding company of Transport Pool was listed by NASDAQ. By this year Transport Pool opened branches in Belgium. By 1975 Transport Pool entered Irish and Swedish markets. When recession hit in 1975, the firm’s stock dipped to $2 per share. Minneapolis-based Gelco Corporation, a firm that leased cars and trucks to large corporate fleets, offered $5 per share (about $30 million). The company was sold, with about 500 employees at the time. Transport Pool’s operation changed little under Gelco’s supervision. In the 80-s TIP started to expand more in the Nordics, adding Denmark and Finland to its geographical portfolio. In the early 80-s TIP operated a fleet of over 14.000 trailers and container chassis from over 60 branches throughout the Europe. Gelco's acquisition of CTI Container Corporation resulted in financial losses that TIP’s profits were ultimately unable to offset. In 1986 and 1987, Gelco reported losses of $6.4 million and $4.9 million, respectively. To recover, Gelco sold TIP Europe in 1986 to a management and investor consortium. TIP completed management buyout backed by HAL as an outside investor. Employees were allowed to buy stock options. Before the acquisition TIP had a fleet of approximately 11.000 assets and was operating in the following countries: UK&IE, Germany, France, Denmark, Finland, Sweden, Netherlands, and Belgium. In 1993 TIP was brought in as a stand-alone division of GE Capital. After this acquisition, the business was transformed into a full-service leasing and rental company. TIP started to expand the business and became more structured in its processes. The main goal was to become number 1 trailer leasing and rental company. Laurie Weisheit was a CEO at the time. Also in 1993 TIP launched remarketing trailer sales operations. Before and during this acquisition TIP started to be active in Norway, Italy, Spain and Austria. The UK still had the biggest fleet with high amount of box vans, and Germany remained the second biggest market. In 1997 TIP acquired Central Rentco (CTR) group - rental and leasing company spread all around Europe. With this acquisition TIP grew its fleet with around 22.000 additional units. Bob joined GE in 1982 and held leadership positions in a number of GE divisions including roles in Finance, Sales, Business Development, Marketing, Leasing, and General Management. He was appointed to the position of chief executive officer of TIP in 2003. By 2003 the fleet grew to 67.000 trailers. Around the same year TIP became active in Eastern European countries such as Poland, Romania, and Czech Republic. In 2007 TIP entered into third party maintenance services segment. The UK were the first region to in-source their branch workshops and technicians. It started at the back end of 2006 and most locations were completed by the end of 2007 and included a few mobile service units (MSUs). Later on it was brought on the European level. Fleet-Care was established, which completed the services portfolio and could be bought separately. Pan European TIP Roadside service became a service on its own. HNA Group Company Limited (HNA) of China, a leading diversified industrial and services company, acquired TIP Trailer Services Group (TIP). 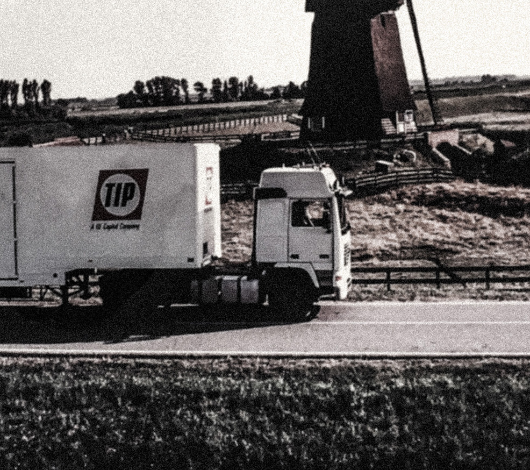 At that moment of time TIP operated a network of 48 branches throughout 16 European countries, and owned and managed the fleet of 48,000 units. TIP took advantage of a favourable financing market to expand liquidity while substantially reducing cost and diversifying funding. In 2014 a smartphone app for trailer fleet operators to create inspection reports online with photo, search, share, and compare features was launched. TIP supported HNA in the acquisition of Grayrentals’ trailer leasing and rental business based in Hull, United Kingdom. Toscon offers national coverage for repair and maintenance of (semi-)trailers. In 2015 acquisition of Toscon almost doubled TIP 3rd party maintenance and repair revenue in the Netherlands. In 2016 TIP Trailer Services Group has acquired Train Trailer Rental Ltd, a Canadian provider of trailer rentals, leasing and storage. In 2016 TIP Trailer Services acquired Dutch rental and leasing company, Twan Heetkamp Trailers (THT), which had a fleet of around 3,000 trailers operating across Europe. In 2018 TIP Trailer Services celebrate their 50-year anniversary. I Squared Capital (ISQ), an independent global infrastructure investment manager acquired 100 percent interest in TIP Trailer Services from HNA Group (International) Company Limited.